Fans of colorful bubble shooters now have a new option available in Cookapps’ Bubble CoCo on Facebook. 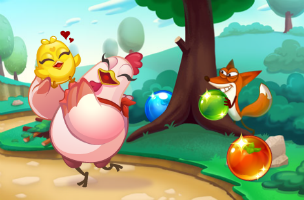 The game challenges players to help a chicken named CoCo rescue her children from an evil fox by shooting bubbles at large formations at the top of the screen. The goal of each shot is to create matches of three-or-more like-colored orbs, so they will be removed. Each level of Bubble CoCo has a different overall goal. One may ask players to collect the feathers trapped in bubbles at the top of the screen (by simply clearing those bubbles), while another asks them to rescue chickens that are trapped in the bubble formation, by clearing all of the bubbles surrounding them from the board. Players can press the space bar or click on the bubble slingshot to swap between two active bubbles, and they have access to power-ups which may help in challenging stages. For instance, an aiming trajectory line helps players line up the perfect bank shot, while a lightning storm can be used to clear a large group of bubbles from the screen. These powers can be purchased with coins before a level begins, with coins being earned as gamers complete stages. Coins can also be purchased with premium currency (real money). Eventually, additional powers are unlocked for purchase within a level itself. One power, a rocket, can be used to destroy all bubbles in a straight line after it’s fired from the slingshot, as an example. When players complete a level’s requirement(s), any leftover moves are turned into bonus points. Players earn up to three stars on each stage, depending on their final score, and can keep track of their scores on the in-game leaderboards. If players fail to complete a level before running out of moves, they lose a life. These recharge automatically over time, can be sent between friends as free gifts, or can be purchased with premium currency. Bubble CoCo is available to play for free on Facebook.